$0.68 for Sambazon Organic Amazon Superfood Juice or Smoothie w/ Coupon! FREE at Publix! 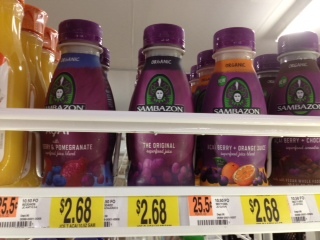 Hurry and print this high-value Sambazon Juice or Smoothie coupon to get a great deal at Walmart! Also, several people have seen these are on sale at Publix for $1.99, making them FREE! NOTE: You can also print out a FREE product coupon over at their Facebook page! I've never tried this drink before, but it sounds yummy and healthy! Thanks, I Heart the Mart for price check and photo!